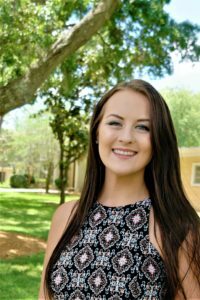 Savannah Bates won the Fred B. Noble Gold Medal for Scholarship, the University’s highest academic award for graduating seniors, at Spring 2017 Commencement. 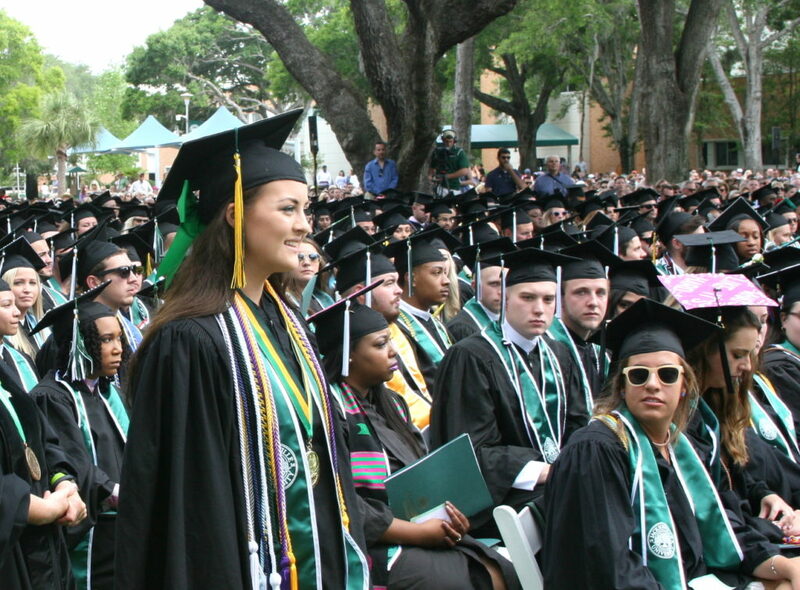 She won Jacksonville University’s top mathematics scholarship in 2015, was named its Woman Student of the Year in 2016 and earned its highest academic honor in 2017. 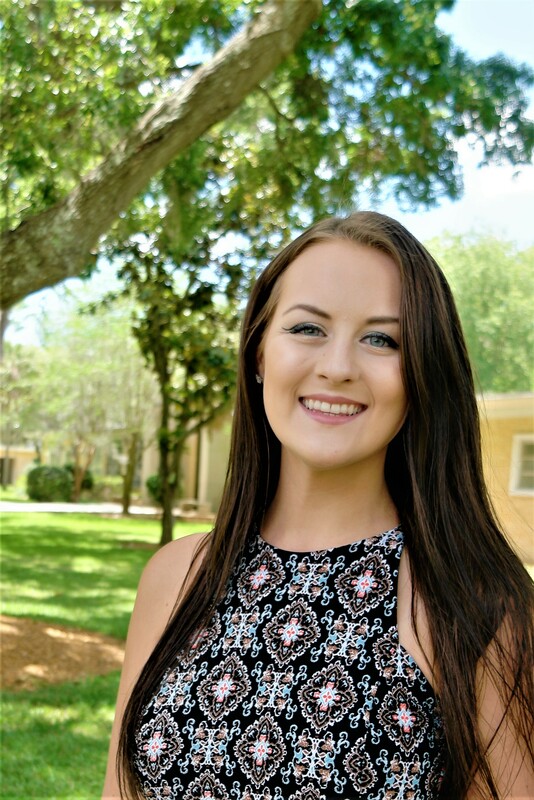 Now spring graduate Savannah Bates has gone national, winning the prestigious Phi Kappa Phi Fellowship to pursue her Ph.D.
Only about 50 students from the honor society’s hundreds of chapters win the $5,000 award annually to support their first year of graduate or professional study. Bates will use the funding this fall as she studies biomathematics at North Carolina State University, where this summer she is already doing HIV modeling research under Dr. Ruian Ke, who specializes in viral dynamics and mathematical theory. The award is especially meaningful to Bates, in light of the obstacles her family has faced with the severe disability of her brother DJ. He was not expected to survive after being born with twin-to-twin transfusion syndrome (TTTS), which resulted in the stillbirth of his twin and his own massive brain damage. While in graduate school, Bates plans to delve into systems of differential equations that represent biological processes — typically disease transmission or its spread. For example, she said, her current HIV research uses a system of 10 differential equations to represent concentrations of the types of T-cells essential for human immunity. “We hope that studying this mathematical system will shed light on strategies for a cure for HIV. There are a lot of studies currently happening that seem very promising. I am hopeful that a cure for HIV will be found in my lifetime,” she said. Dr. Ke said that when considering new employees for summer work in his lab, he was impressed with Bates’ keen interests in doing research in infectious diseases, and that she stood out as a clear thinker and independent and mature individual. Savannah Bates with President Tim Cost after winning the Fred B. Noble Gold Medal for Scholarship. 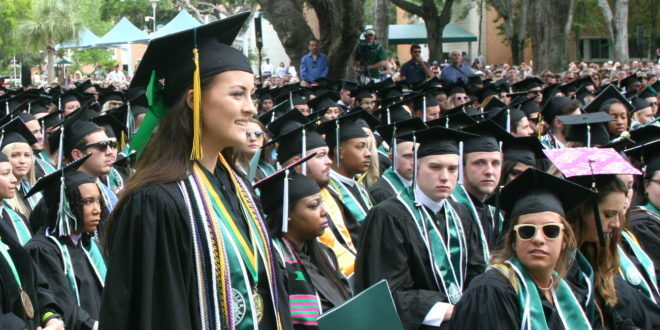 At Jacksonville University, Bates received a bachelor’s degree in mathematics, earning a 4.0 GPA. She was a top undergraduate researcher and won the Fred B. Noble Gold Medal for Scholarship, the University’s highest academic award, given to graduating seniors with the highest cumulative GPA. 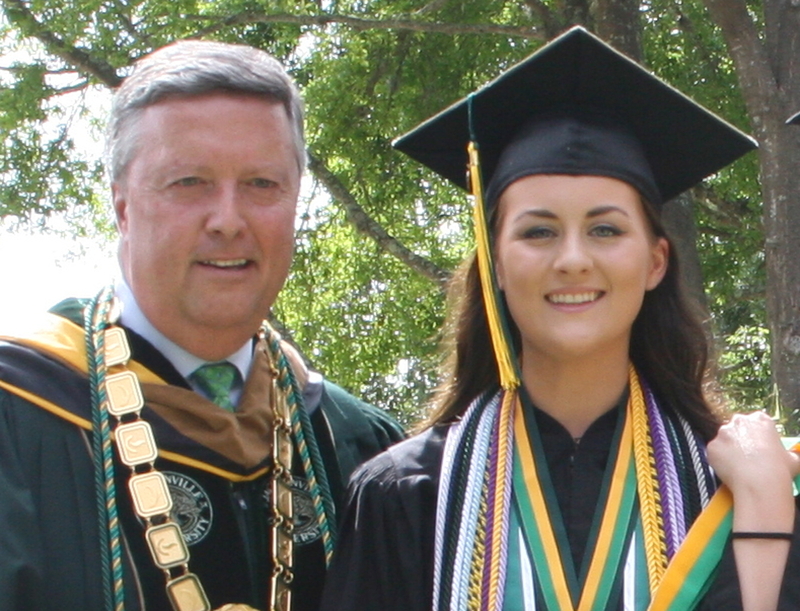 In addition to serving as president of the Mathematics Society, Omicron Delta Kappa Honor Society and JU Honors Student Association, Bates was a member of Green Key, Phi Kappa Phi, Sigma Alpha Pi and Who’s Who. She was also named the Division of Science and Mathematics and College of Arts and Science Student of the Year in 2017 and Woman Student of the Year in 2016, and received the John F. Golightly Award and Scholarship in Mathematics in 2015.